Nearly 60 third year Introductory Pharmacy Practice Experiences (IPPE3) students from the School of Pharmacy will participate in the Pittsburgh Recovery Walk on Saturday, September 16. The walk celebrates the many roads to recovery from substance abuse and addiction. 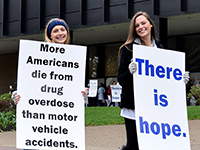 According to Dr. Janet Astle, Assistant Dean for Student Services for the School of Pharmacy, the IPPE3 students will line the walk route with signs that shed light on addiction and recovery. Following the walk, the students will work at two tables hosted by the School of Pharmacy at the Recovery Expo in Market Square. Astle said that one table will provide education on Naloxone rescue for opioid overdoses, while the other will provide information on medication-assisted treatments that can be used in recovery. Registration for the walk through the streets of Downtown Pittsburgh begins at 9 a.m. The expo takes place from 11 a.m. to 1 p.m.